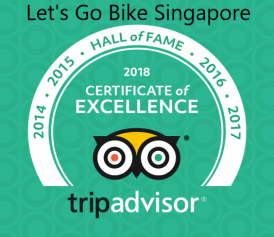 Let’s Go is a travel agency licensed by the authorities (Singapore Tourism Board). We have proper insurance coverage and use only licensed tourist guides. The terms & conditions of your travel insurance typically state that you must use only licensed establishments for your travel activities. Travel safe with us. Thousands of happy guests have ridden with Let’s Go! The guests’ photos on our Facebook page explain why better than any words. You can even see guests who joined us just a few days ago! Our maximum group ratio is 8 riders + guide. This is for safety, and it also means you get more value and attention from us. The only time we have more when it’s a family/friends/tour group. And yes, we will ride even if there is only one guest! Let’s Go staff hate tourist traps when we travel, so why should we bring our guests to any? We promise you a wonderful ride undistracted by shopping (you can go on your own afterwards!). We’ll bring you to see the real Singapore. Sample local drinks and snacks. Eat where Singaporeans eat. See a local market and residential area. Watch the locals go about their day! We provide helmets, rain ponchos, bottled water, wet/dry tissues; etc. for your utmost comfort. Our lightweight helmets are sanitized after each use. No one says it better than our guests! Read our numerous reviews on Tripadvisor or our guest Celine’s blog! We are also in Tripadvisor’s Hall of Fame (Certificate of Excellence for 5 consecutive years)!